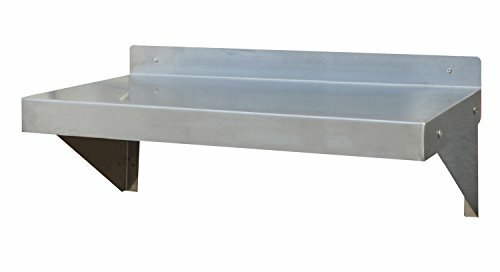 The Stainless Steel work shelf is the perfect addition to your kitchen, garage, or basement. A smooth 24 x 12 in.surface provides additional storage space for supplies. Curved edges help prevent injuries from accidental bumping and injury. Raised edges on three sides keep items on the shelf and off the floor. The brushed stainless steel finish is easy to clean and has an attractive contemporary design. Max weight capacity 132 lbs. Constructed of 18 guage 420 stainless steel with rounded front edge for safety. Easy to assemble. Raised edges on three sides keeps items on the shelf and off the floor. Max weight capacity 132 lbs. Material: Stainless Steel. Color: Silver. Warranty: 90 Day Limited.